MOSCOW, May 7. /TASS/. The presence of acting Finance Minister Anton Siluanov in the new line up of the Russian government would be a positive signal for investors, head of the Research Institute of Finance at the Finance Ministry Vladimir Nazarov told TASS. "There is a hope that Anton Germanovich (Siluanov - acting Finance Minister - TASS) will work in his new capacity as efficiently as he works in the Finance Ministry," Nazarov said. According to him, the policy of the Finance Ministry and the Central Bank resulted in macroeconomic stability and low inflation, which created a "new economic reality" for Russia. In particular thanks to the fiscal rule, now the impact of oil prices on the national currency rate has significantly decreased, the expert said. "Therefore, in my opinion, this is a good sign for investors that such a policy will continue, that nothing threatens the ruble or Russian bonds," the expert said. In addition, the Finance Ministry has always opposed the increase in the tax burden, which is also a positive signal for investors, the expert added. The Russian government stepped down as Vladimir Putin assumed office as Russian President on Monday. The Cabinet’s duty to resign in full force after the president assumes office is enshrined in Article 116 of Russia’s Constitution. Customarily after that the prime minister, his deputies and ministers switch to the status of "interim" officials until a new Cabinet is formed. Under the Constitution, the head of state is to submit to Russia’s State Duma (lower house of parliament) his proposal for a new Cabinet head no later than two weeks after the government’s resignation. The lower house of parliament must consider this proposal within a week. 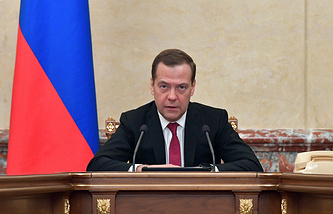 The fiscal or "budget" rule is the mechanism of formation of Russia’s budget. It determines the maximum level of spending on the basis of oil prices. The aim of the rule is to make the budget less dependent on market revenues. The essence of the rule is that additional revenues that are raised from sale of oil and gas should be transferred to the Reserve Fund. Such additional revenues emerge in case when the actual price of oil exceeds the price in the forecast.